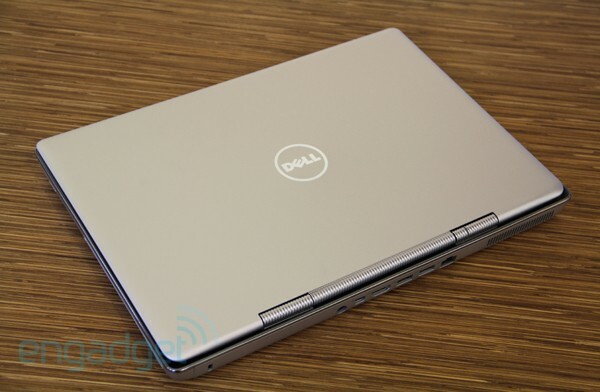 As far as product launches go, Dell didn't exactly rip the Band-Aid off the XPS 14z. After teasing it back in September, the company let all the specs out of the bag, but stopped short of naming a price and ship date for the United States. Well, now we know: this 14-incher will be available in the US and Canada November 1, and will start at $1,000 -- a price that puts it in direct competition with the likes of the HP Envy 14 and Sony VAIO SA series. Like these other laptops, the 14z commands a premium over cheaper models, with beefier specs and a (supposedly) more luxurious design. With Core i5 and i7 processor options, discrete graphics, USB 3.0 and an optional solid-state drive, it offers a lot of the same specs as its peers, though it manages to stand out in a couple key ways. One, it sports an LG Shuriken display, which crams a 14-inch screen into a chassis normally reserved for 13-inch systems (translation: its bezels are super narrow). And with a starting weight of 4.36 pounds, it's lighter than a lot of the other laptops you're probably considering. But are these bullet points enough to make it a smart buy? Read on to find out. The 14z offers good battery life, extra screen real estate and excellent ergonomics, though you can get stronger graphics performance from less expensive machines. 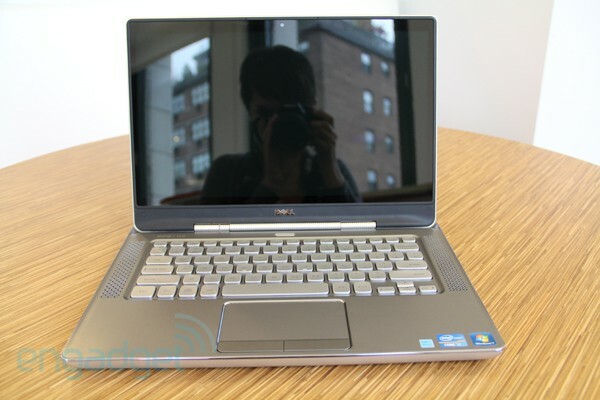 How would you rate the XPS 14z? With the exception of that Shuriken display, the XPS 14z is essentially the XPS 15z, cut down to size. Which is to say, it bears an imperfect resemblance to a MacBook Pro. 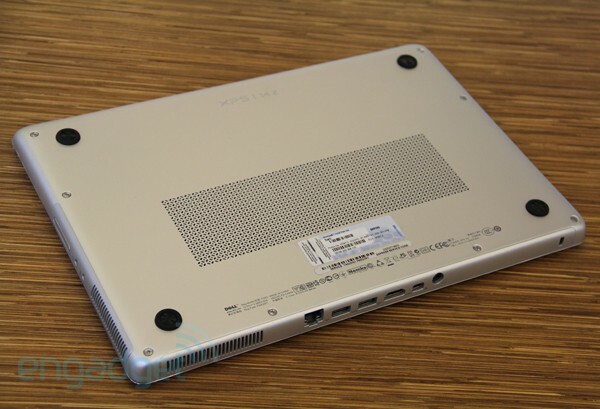 Once again, you'll find smooth aluminum surfaces, clean lines and a backlit keyboard flanked by long speaker strips. As we pointed out last time around, it even borrows Apple's tiny arrow keys and rubberized feet. Thankfully, though, Dell seems to have heard some of our gripes about the 15z -- this time, the company stacked some of the ports on the back edge, whereas the 15z crams them all on the left side. Good riddance, we say -- it's an impractical enough design choice when Apple does it. Speaking of ports, Dell included HDMI, a Mini DisplayPort, Ethernet, headphone and mic ports, a 7-in-1 memory card reader and two USB ports (one 2.0, the other 3.0). Truth be told, this isn't even the most shameless Mac impersonation we've seen (that might well be HP's Envy laptops). In addition to its magnesium alloy build and little black feet, the 14z adds design flourishes that would never fly in Cupertino. For one, it has discrete touch buttons and the kind of recessed hinge that's become Dell's signature over the past few years. Additionally, it sports the same chrome accents, ridged hinge and patterned speakers / vents adorning the 15z. In conversations with Dell, company reps told us the 14z is aimed at creative types who feel the need to express their personality through their notebooks. Specifically, that means people who like a few embellishments on their $1,000 laptop. The peculiar thing about the 14z is that it's one of the more ergonomically sound laptops we've tested recently, even though it doesn't feel like the high-end notebook it's supposed to be. On the one hand, that sunken hinge means that when you rest the laptop on your lap, the weight distribution between the chassis and display feels balanced. What's more, it does a marvelous job of expelling heat -- even after settling in for a few hours of work on the couch, our legs never felt the burn (we wish we could say the same about the MacBook Pro). At 4.36 pounds (4.12 if you upgrade to an SSD), it feels reasonably lightweight, especially considering you get the benefit of a larger display than is typically used in a laptop with these dimensions. (The 13-inch MacBook Pro weighs 4.5 pounds, for instance.) Dell also says this is the thinnest "fully functional" 14-inch laptop, at 0.9 inches (23mm) thick, though if we're being honest, we wouldn't describe it as skinny, per se. (Plus, uber specific superlatives are kind of silly.) It does offer clean lines, though, particularly with that hinge that makes the lid lie flat. It's also worth pointing out that even though this thing packs an 8-cell battery, it's completely flush with the system, meaning you won't find any unsightly bulges here. Then again, that battery is non-removable, which may or may not be your cup of tea. But if one of Dell's goals was to build a premium laptop that celebrates attention to detail, it fell short. For all its aluminum and chrome trim, the 14z feels common. While you may or may not notice that it's made from multiple pieces of mag-alloy as opposed to a unibody frame, it's difficult to ignore the palm rest and deck, which are coated in a slick, warm-to-the-touch finish. In fact, it's easy to mistake the interior for plastic -- an irony, given that one of Dell's selling points here is that the entire laptop (even the bottom) is fashioned out of metal. 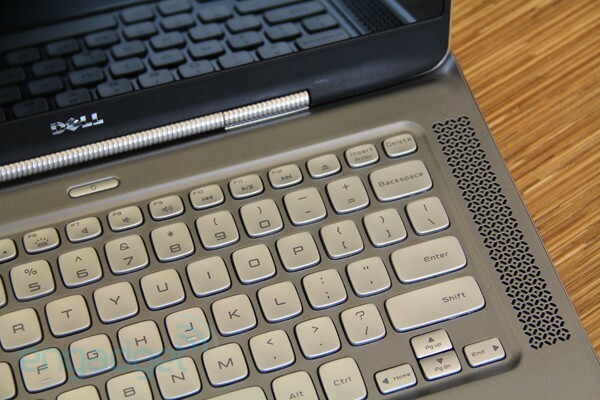 Meanwhile, the lower-end Inspiron 14z ($599.99 and up) also measures a little less than an inch thick and sports a sunken hinge, 1366 x 768 display, optional backlit keyboard and a (mostly) metal chassis. It's true that the Inspiron 14z has a tray-loading optical drive and a bulge on the bottom where the battery sits, but we wish the XPS 14z made a more convincing case for why people should get this instead of the $600 model. Though not perfect, the 14z's keyboard is one of the better ones we've been treated to lately. Unlike lots of other chiclet-style 'boards we've tested, these keys actually have some depth to them. That extra travel means we didn't have to worry about mashing the buttons to make sure our presses registered. Depending on your tastes, though, one possible downside to that kind of tactility is that typing can get quite noisy. At least that low-pitched click is backed up by a sturdy, bend-free panel. The keys also have a slick finish that matches the palm rest, and while we thought that would be a problem, we banged out emails, web searches and this very review at blazing speeds, with only a handful of spelling errors slowing us down. If a reviewer's posture is any indication, picture us leaning back on a couch, legs propped up on the coffee table, with the 14z resting comfortably in our lap. A good sign, given that we've written many a laptop review hunched over the keyboard, cursing. And yes, to answer the question on many of your minds, this keyboard is backlit, and it is a standard feature. The white glow behind the keys is gorgeous, and goes further in making this look like a high-end machine than, say, that embellished hinge. Happily, it'll kick in regardless of whether you're working in a dark or well-lit room. It even glows when the laptop has been sitting idle for some time. And for those of you who think backlit keyboards are just a design flourish that helps justify its higher cost, you might be right -- if you're not the kind to work through an overnight flight or wake up at the crack of dawn to pound out a 4,000-word review in your dim living room (ahem). The best compliment we can bestow on a trackpad? We weren't aware we were using it. That was often true of the 14z, which pairs a 2 x 4-inch pad with two discrete buttons. What can we say, except that they present a completely drama-free experience? 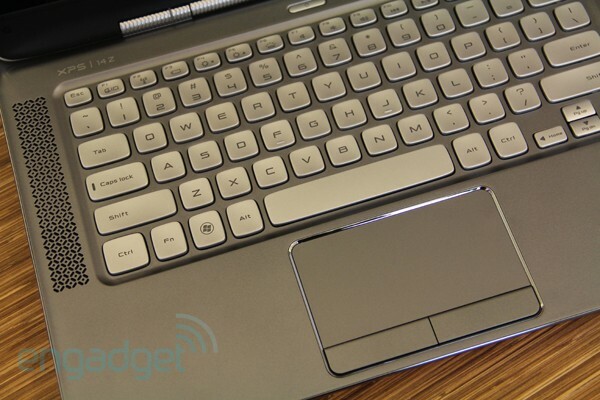 The touchpad has a smooth, low-friction surface, and everything from pinch-to-zoom to two-fingered scrolling works smoothly. And while those twin buttons might make the 14z look slightly dated compared to laptops sporting buttonless trackpads, we'll take function over form if those seamless touchpads continue to be so unreliable. As it happens, the buttons are quite tactile. You might find them a tad mushy, even, but so long as they're easy to press, we're happy campers. If you're looking for a high-res display to go with your backlit keyboard and magnesium alloy chassis, you'll be sorely disappointed. The 14z offers a 1366 x 768 panel, putting it in the same boat as the HP Envy 14 and the 13-inch MacBook Pro, whose 1280 x 800 pixel count is nothing to crow about either. Honestly, this is pretty standard fare for 13- and 14-inch laptops, though there are a few gems offering more pixels per inch. The ASUS Zenbook UX31 Ultrabook comes standard with a 1600 x 900 screen, as does the Sony VAIO SA, whose starting price recently dropped to $1,000, putting it on par with the 14z and Envy 14. But the pixel count doesn't tell the whole story. The extra screen real estate the Shuriken display provides is just glorious. Though it might seem like a trivial difference, having virtually no bezel meant we enjoyed a noticeably larger canvas than we're used to on typical 13-inch machines. You may still feel the squeeze if you use Windows 7's Snap feature to view two pages side by side, but we otherwise appreciated the broader workspace. As you may have gathered, we wrote much of this review in a dimly lit room, and the 200-nit display was bright enough that we never felt the strain. The viewing angles are mixed. On the one hand, if you watch from off to the side you should be able to follow along, though as you approach an oblique 180-degree angle, the contrast predictably becomes too severe to follow along. We noticed less flexibility when viewing the screen head-on, though. Even if you dip the screen forward slightly, the picture turns pale and washed-out. Though the speakers are loud, the sound quality's pretty tinny. Not just tinny -- after all, most laptops are -- but also buzzy and distorted, especially at the max volume. Though the XPS 14z is marketed as a premium system, the audio is mediocre at best. Our $1,300 test laptop came armed with a 2.8GHz Core i7-2640M CPU, 8GB of RAM, a 750GB 7,200RPM drive and dual graphics cards, with Intel's HD 3000 on the integrated side and NVIDIA's GeForce GT520M with 1GB video memory on the discrete. Unsurprisingly, its benchmark scores generally fall below what you'd get with a system that has an SSD, but outrank machines running on Core i5 CPUs and HDDs. Still, the 14z doesn't exactly steamroll more modestly specced laptops either. For instance, a $1,400 configuration of the Lenovo ThinkPad X1 logged an awfully similar PCMark Vantage score, even though it has a Core i5 processor, integrated graphics and half the RAM. The 14z also boots in 53 seconds, which is reasonable for a typical Windows 7 laptop, but slower, perhaps, than what we were expecting, given the stellar components powering this thing. And if numbers are any indication, the 14's graphics performance isn't the cream of the crop. 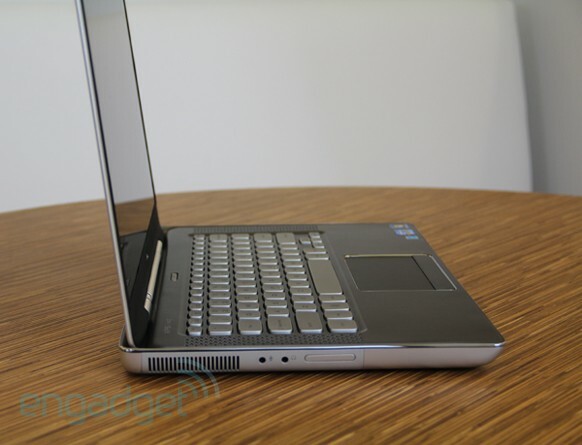 When we reviewed the current-generation HP Envy 14, we tested a less expensive $1,080 configuration that combined a Core i5 processor, 7,200RPM drive and dual graphics with AMD's 1GB Radeon HD 6630M on the discrete side. It costs two hundred dollars less than our XPS 14z unit and has a weaker processor to match, but managed to outperform the 14z in 3DMark06 by 1,800 points. Additionally, our 14z's 3DMark score is similar to what we got from a $1,000 Sony VAIO SB with a Core i5 CPU, 5,400RPM drive and a Radeon HD 6470M card with just 512MB of video memory. For a configuration that costs so much more, we would have expected it to have the most graphics oomph. All that said, the 14z can hold its own in multitasking, and ran without a hiccup while we juggled a dozen browser tabs, re-sized a group of pictures in BatchPhoto and installed a series of programs. Over a few days of using the 14z as our primary computer, we did notice it produces a fair amount of fan noise, even when left idle. It's a subtle enough sound that you won't hear it over music or a TV, but you might well if you're sitting at your desk with few other distractions in the background. What the 14z lacks in screaming benchmark scores, it makes up for in relatively long battery life. Under the best circumstances, Dell promises up to six hours and 42 minutes of juice. But that's for the US market, specifically. In China, Dell's promising six hours and 58 minutes of runtime. According to the footnotes in the guide that Dell sends to reviewers, it used our configuration with a Core i7 processor and 8GB of RAM to arrive at that estimate for the US market. Projected battery life for the Chinese market is based on tests with a machine that had a Core i5 CPU and 4GB of memory. Not that we expected to hit either of those ceilings. In our standard rundown test, which involves looping a movie off the local drive with WiFi on and the brightness fixed to 65 percent, it lasted four hours and 54 minutes. Not bad when you consider the HP Envy 14 crapped out an hour earlier. Meanwhile, the VAIO SB series, another machine with dual graphics, made it three and a half hours in so-called speed mode, and lasted five hours and 11 minutes in "stamina mode," putting it on par with the 14z. Oy. Dell's really not doing anything to combat its reputation for saddling its laptops with crapware. On board, you'll find Roxio Creator Starter, McAfee Security Center, Skype 4.2 with matching toolbars, Zinio Reader 4 and Nero SyncUp. The company also threw in a generous helping of its own software, including the Dell Stage launcher where you'll find shortcuts for music, photos, et cetera. 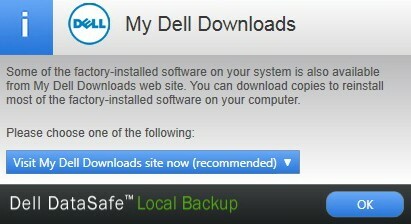 Then there's Dell's DataSafe local and online backup, which affords you 2GB of storage, gratis. The worst part is that it's all so intrusive. As soon as you start up the machine, you'll be assaulted by pop-ups reminding you to back up your data, activate McAfee, update your security settings and accept Nero's EULA. We've seen PCs with minimal software loads, but it's because of systems like this that Windows machines have earned a bad rap for being stuffed with unwanted software. In any case, we're hoping this will machine will be available through the Microsoft Store, which sells PCs with much of the bloatware stripped out. Update: A Microsoft rep confirmed that the Microsoft Store will indeed sell a trialware-free version of the XPS 14z. Though the configuration we tested rings in at $1,300, the XPS 14z starts at $1,000 in the US with a 2.4GHz Core i5-2430M processor, 4GB 6GB of RAM, a 500GB 7,200RPM hard drive and integrated Intel HD 3000 graphics. From there, you can swap in the 2.8GHz Core i7 processor we tested, up to 8GB of RAM and either a 750GB 7,200RPM drive or a 256GB SSD. On the graphics side, of course, you can get that GT520M card with 1GB of video memory, and you can also elect to add NVIDIA's Optimus graphics-switching technology. Regardless, you'll get an 8-cell battery and slot-loading DVD burner (Blu-ray isn't an option here). If you're curious, a tricked-out model with a Core i7 CPU, 8GB of RAM, NVIDIA Optimus and a 256GB SSD will set you back $1,600. The 14z isn't alone in that space of $1,000 laptops that command a premium for a striking design and nice performance boost. In HP's camp, there's the Envy 14, which, like the 14z, starts at $1,000 with a 2.4GHz Core i5-2430M processor, eight-cell battery, 6GB of RAM and a 500GB 7,200RPM drive. However, the standard graphics card is an AMD Radeon HD 6630 with 1GB of video memory. We'd argue it's also a more striking machine, but it's also significantly heavier, at 5.7 pounds, and with a 14.5-inch (1366 x 768) display, you're not getting that much more screen real estate in return. Moving on to Sony, the company has two 13-inch laptops - the SB series ($800 and up) and the higher-end SA ($1,000 and up) -- that can compete with the XPS 14z. We won't dwell too much on the SB, since even the higher-end specs are fairly modest, but the SA -- now, that's a fierce match for the 14z. For the starting price of $1,000, you get the same 2.4GHz Core i5 processor that the 14z starts with, but the resolution is 1600 x 900 and the graphics card is an AMD Radeon HD 6630M with 1GB of video memory. (Then again, that model comes with a slower 5,400RPM drive.) Like the 14z, the SA is offered with the 2.8GHz Core i7 CPU we tested, though if you had the money and enthusiasm you could add a Blu-ray player and up to 1TB in solid-state storage (dual drives, mind you). With the 14z, the maximum capacity is 750GB, and that's with an HDD; with an SSD it's just 256GB. And what of that MacBook Pro? The 13-incher starts at a higher price -- $1,199 -- and now comes with more modest specs, including a 2.4GHz Core i5 processor, 4GB of RAM, integrated Intel graphics, a 1280 x 800 display and a 500GB 5,400RPM hard drive. It's well-designed with great battery life, to be sure, but no one ever said it was a bang-for-your buck laptop. We cranked out a lot of work on this thing. We typed thousands upon thousands of words on this laptop, and barely noticed the keyboard and trackpad -- as good a sign as any that they've been designed with care. That expansive Shuriken display does indeed make a difference, while other key details like long battery life, a light build, sunken hinge and an effective heat management system make it one ergonomically sound laptop. We can think of more arresting laptops with beefier entry-level specs, such as the Envy 14 and VAIO SA, but the XPS 14z is nonetheless a sensible choice, even if it's not the fastest or prettiest. ROUND ROCK, Texas, Oct. 24, 2011 – Dell today unveiled its XPS 14z laptop, the thinnest fully featured 14-inch laptop featuring an internal optical drive and discrete graphics option. The latest in a series of thin-and-powerful solutions from Dell that include thin laptops, desktops and accessories, the XPS 14z delivers performance that impresses and design that inspires. Professionals now can power through their day at work and kick back at night to take advantage of the system‟s HD screen to watch movies or video. The XPS 14z is the latest member of Dell‟s portfolio of thin-and-powerful solutions, and the second such solution in the XPS family, joining the successful XPS 15z laptop. Dell's thin-and- powerful solutions now include the Inspiron 14z laptop, and the Inspiron One all-in-one computer that are ideal solutions for parents and students, as well as the Vostro V131 laptop for small businesses. All solutions are designed to deliver impressive performance in beautiful packages. The 14-inch HD display easily fits into a 13-inch laptop form factor – while offering 10 percent more viewing area than a 13.3" display. And starting at just 4.36 poundsi, less than an inch thin, and up to six hours, 42 minutes of battery lifeii, it also has the easy portability of a 13-inch laptop. The XPS 14z's uncompromising performance helps busy professionals achieve their personal and professional pursuits – and look good while doing it. 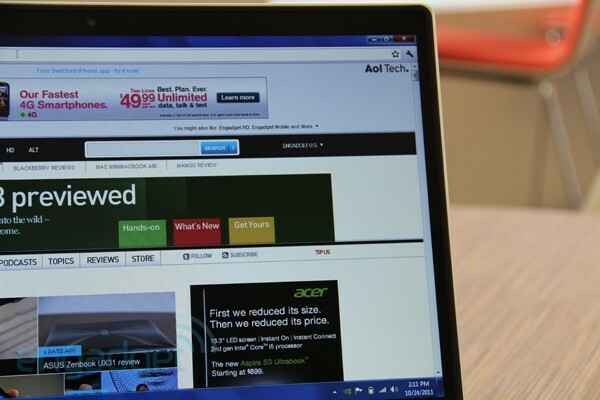 The XPS 14z is visually striking, with a slim, yet powerful form synonymous with innovation. Its anodized-aluminum finish is stylish and sophisticated, and the latch-less design is simple, yet elegant. "The XPS 14z delivers what professionals want – raw power paired with a stunning, sophisticated design that signals, I've arrived," said Steve Felice, president of Dell‟s Consumer and Small/Medium Business group. "The XPS 14z is specifically engineered to help our customers do more in their personal and professional lives – and it advances our industry-leading vision for thin- and-powerful solutions that deliver performance without compromise." "When Dell looks at innovation and product development, we start with the customer. For us, it‟s about delivering the right feature-set and design to provide the best user experience for our customers," said Sam Burd, vice president of Dell‟s Consumer and Small/Medium Business product group. "With the XPS 14z, our challenge was to build a laptop that provided customers the performance and portability that they need, with the design and finish they desire." Shoppers can also enjoy hands-on time with the XPS 14z at 38 Dell.com locations across the U.S. Popping up just in time for the holidays at top retail malls, Dell.com locations will allow customers to experience a wide range of Dell products in one place, have play time, and witness how they work together seamlessly for the digital home. Dell.com locations are now open at the Barton Creek Mall in Austin, Texas and the Orland Mall in Chicago, Ill. Another 36 Dell.com locations will open across the U.S. in early November. Dell will host CreateWorkInspire, a creative installation designed to showcase Dell's new thin-and- powerful suite of products within the context of a creative professional's real, functional workspace, Nov. 2-4 in New York‟s Soho‟s Open House Gallery from 10am to 6pm. Sleek, light, well-designed and elegant, CreateWorkInspire invites visitors to see first-hand how Dell's thin- and-powerful products enable customers to create, work, and ultimately inspire.